Looking for a vegan alternative for a BLT? Here it is. The TLT. This is the most simple version. Of course you can add extras as you like. Get some Tofurky Brand Tempeh Smoky Maple Bacon Flavor. Toast a slice of your favorite bread or I use pita bread. Smash some avocado on the toast. Add on the cooked tempeh, chopped tomatoes and spinach or any greens you prefer. Too easy, delicious, and filling. Version 2 can be a TLT wrap. I like to use Rudisbakery.com Spelt Tortillas. They hold up really well and have no high fructose corn syrup. 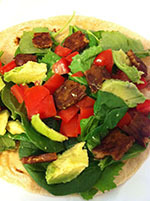 You can add in the tempeh, tomato, spinach, avocado, cilantro, and dress it with a mixture of Followyourheart.com Vegenaise and Dijon mustard mix or a hummus salad dressing.